One common accusation that the American right wing levies against policies that they oppose is to call it unconstitutional. These partisan accusations of unconstitutionality are leveled by a wide variety of political actors, including politicians and political pundits. This tactic is used to sway low information voters against their own interests through appealing to their loyalty to an imagined interpretation of the constitution. Republican politicians have declared a wide range of government functions to be unconstitutional. This list includes, but is not limited to: entitlement programs, regulatory agencies, the Federal Reserve, child labor laws, the Department of Education, and social welfare programs. Most of these programs are demonstrably constitutional, and have been settled law for decades. The accusations of unconstitutionality levied against these programs by the right wing are not intended to be factual, merely rhetorical, and are aimed at inciting a nationalist, yet ignorant, base. This tactic is often used to attack functional policies—for which there are few other attacks available—or policies where any other method of attack would put the right wing into a politically contentious position (ex. attacking child health programs based upon constitutionality rather than fairness or morality). One example of this tactic in action was seen during the 2012 Republican presidential primary competition: Virtually every candidate on the primary stage—as well as numerous right wing political strategists—claimed that the Affordable Care Act (“ObamaCare”) is unconstitutional; this claim is blatantly false given not only that the interstate commerce clause allows the federal government to regulate a wide variety of services but also that the idea of the mandate was supported by most of the people who are now fighting it. The entire idea of the mandate was created by the Heritage Foundation (an extreme right wing think-tank), promoted by Gingrich, and implemented by Romney. Unless many on the right wing are willing to argue that their own ideas are unconstitutional when adopted by the Democrats, they clearly don’t believe their own claims of unconstitutionality to be true. The allegations of unconstitutionality during the 2012 Republican presidential primary were not limited to the health care fight, as many Republican political actors made similar claims against other policies. Rick Perry, Ron Paul, and numerous other right wing leaders all claimed that the entire social safety net (Medicare, Medicaid, and Social Security) is, in fact, unconstitutional due to the fact that it is never mentioned in the constitution. In addition to the candidates, right wing leaders decried various policies—including joblessness benefits, federal monetary policy, banning prayer in schools, and protecting a women’s right to an abortion—as unconstitutional overreaches of federal power. Unfortunately, this epidemic of claiming progressive and centrist policy as “unconstitutional” is not only rampant but acting as a mask for the policies that are truly unconstitutional. Using the constitution as a partisan tactic is both abhorrent to the political discourse and dishonest on its face. Rather than fighting a policy position on its merits, those who use this tactic simply smear the opposing policy with lies and never present any facts. Because the claims are not rooted in reality, there is no way to fight them with the facts and the left wing is unable to effectively counter this tactic. Utilizing this tactic is similar to claiming that the moon is made of green cheese and arguing that any samples taken from the moon are obviously fake because they are not made of cheese—the disconnect from reality is so profound that there is no real way to argue against it with fact. Regardless of whether specious allegations of unconstitutionality are an immoral tactic or merely misguided, they desensitize the public to such accusations against truly unconstitutional things happening in politics. Just like in the “boy who cried wolf” parable, when a real accusation is overused, it loses its impact on the population when it is needed the most. In recent years, we have seen several demonstrably unconstitutional legislations suggested and even passed in some occasions. The recent, bipartisan, re-authorizations of the NDAA (National Defense Authorization Act) and the Patriot act are two examples of legislation that have blatantly unconstitutional aspects that have passed without significant challenge. The Patriot Act infringes upon our fourth Amendment rights while the NDAA (in its amended 2012 form) infringes upon our 4th, 5th, 6th, and 8th amendment rights. While the NDAA and the Patriot act are probably the most relevant examples of recent unconstitutional legislation, such legislative overreach is not limited to defense policy. The widespread attacks on a women’s right to an abortion and the recent attempts to limit the voting franchise are two examples of non-defense policy that are, in fact, unconstitutional. At this point, virtually the entire right wing of the US government is united behind false accusation of unconstitutionality while supporting or ignoring genuinely unconstitutional policies. It is important to exclude true originalists (basically, Ron Paul) from the tactical component of this argument as they are not using the allegation of unconstitutionality as a tactic but rather as a genuinely held belief. These people may be deluded and wrong, but they are not using this as a tactic. The concept that anything not expressly mentioned in the constitution is called originalism and, while it is widely discredited as a realistic policy philosophy, that doesn’t mean that those who hold this belief are immoral. The problem in this situation is the use of constitutionality as a tactic rather than a fact. When constitutionality has become devalued to the point where it is dependent upon the partisanship of the sponsor of a bill, it is no longer a true ideal. If the constitutionality of a bill becomes dependent upon its supporter’s partisan affiliation, then the entire idea of the constitution loses its meaning. By promoting the idea that everything the other side suggests is automatically wrong, no matter how reasonable, and everything that your side suggests is automatically right, no matter how egregious the right wing has degraded its credibility on the issue of the constitution. 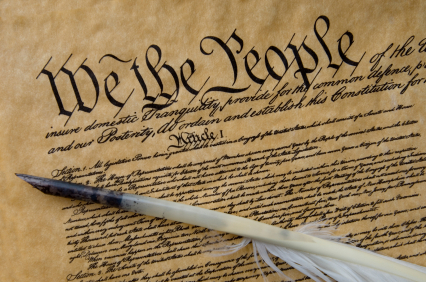 The constitution is the framework of the laws and politics of our country, not a specific set of rules that apply to one party, but not others. Policy disagreements are inevitable in politics, but these disagreements should be based around facts, not false accusations of unconstitutionality. The constitution of the United States should not be used as a partisan weapon, as this only serves to devalue it to the point where truly unconstitutional legislation can pass unquestioned.